There are Loads of Places to Explore on a Day Trip from Brasov! If you’ve done all the things to do in Brasov, it’s time for you to head out on a day trip! Whether you’re looking for a classic Transylvania tour or a day trip from Brasov to Sighisoara, there are lots of amazing sights, hikes, and attractions – all within a day trip’s distance from Brasov. Many people search for day trips from Bucharest but Brasov is more in the middle of the country. So if you can, we suggest staying in Brasov so that you can access more cool things around the country. We like to think you won’t have to search Viator for “Brasov” when you’ve got a lot of the best ideas right here. That said, sometimes the tours from Brasov to Bran Castle, for example, make more sense depending on the season and group size you have. There are even trips where you can visit Bran and Peles Castles on a tour from Brasov. These are all options we’ll discuss in this post! Ready to get started? Let’s research some day trips from Brasov! We really loved Romania, and so if you’re looking for more guides on travelling in Romania, you can check out our other post. Might we suggest getting started here with our first impressions of Romania? Just an idea! Exploring Bucharest in a Weekend – What We Did, Saw, and Ate! Since Brasov is very much in the middle of the country, making day trips from here is a great way to see lots and save money (as opposed to coming from Bucharest to see everything in Transylvania). Here are a few of our favourites – and a few that we heard lots about and wish we would have done! 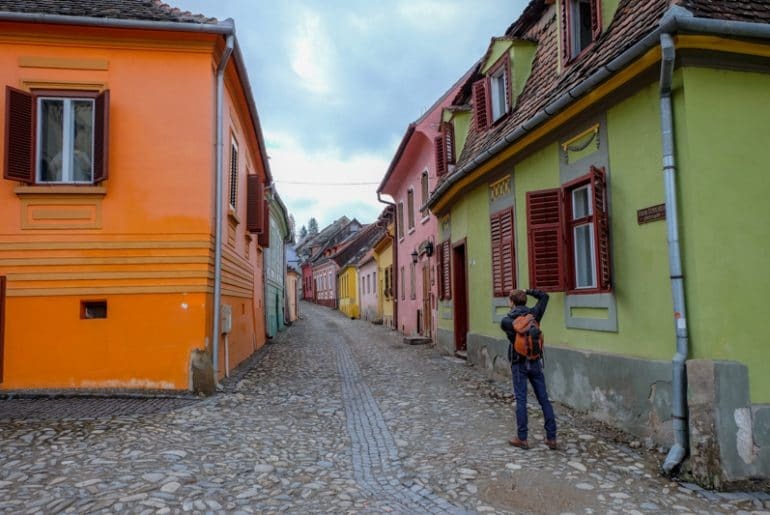 Eric snapping photos in colourful Sighisoara. When we lived in Brasov, we kept hearing about this place called Sighisoara. So, we decided to do an overnight trip there. Sighisoara is a small town with a very colourful medieval old town about 115 km away from Brasov. Depending on the transportation method you choose, it will take you between 1.5 hours (car) and 3 hours (bus/some trains) to get there. We took the train which took a long time. If you decide to take the train you might decide to stay one night in Sighisoara. Otherwise you won’t have a ton of time. This is an option but definitely not a must as even a few hours in the city are enough. We spent a night but looking back we didn’t HAVE to do that. A day tour to Sighisoara from Brasov would have also been a good option if we had known. If you want to learn more about things to do in Sighisoara and some of the restaurants etc. 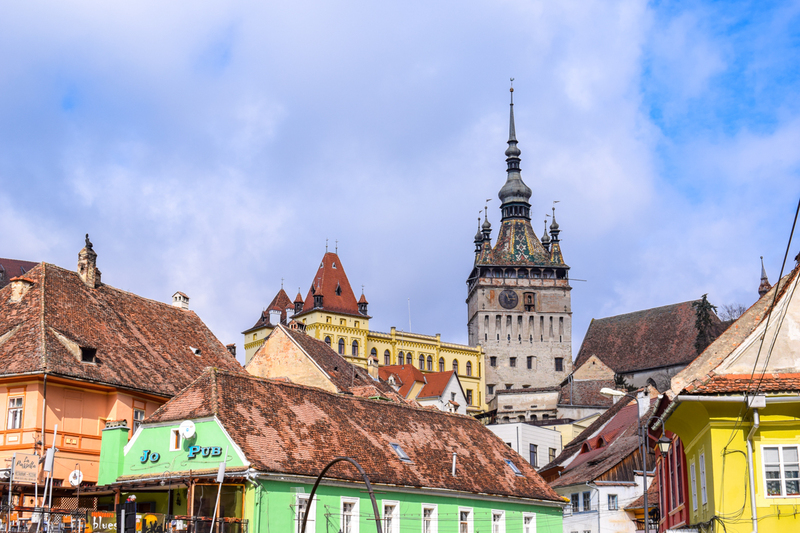 in the town, then read our full guide about Sighisoara here. The famed Bran Castle. Source: Thanks, Pixabay. You can’t go to Brasov (or to Romania, for that matter) without hearing about the story of “Dracula”, the history of the famed Transylvanian region, and the connection to Bran Castle. This is probably one of the reasons why visiting Bran Castle is so high on the list of most people that come to Brasov – it’s the easiest city to reach Bran from! To get to Bran Castle from Brasov, you’ll want to head to the local bus station called Bus Termina No. 2 (not the one next to the train station!). From there you can take a bus to Bran. They run every hour or every half hour (depending on the day and time of week). A one-way ticket should cost 7 Lei and you can check the bus schedule here. If you’re interested in learning more about the history of Bran Castle, you can check out the official website here. This might be a good idea so you have a better understanding of the back story before you get there! Unfortunately, we didn’t get a chance to head to Bran Castle while we lived in Brasov because of the weather and we ran out of time. This just means we will be back to Brasov soon because we really enjoyed living there! Poiana Brasov is a popular winter sports region that is not far from Brasov. The resort area can be reached by taxi, Uber, or bus from Brasov (take the number 20 from the Livada Postei bus stop). If you want to read more about public transport in the Brasov area you can do so here. If you find yourself in Brasov in the winter this is the perfect place to go for a day of skiing. But don’t worry, there are also tons of things to do in the summer. For example, you could visit the Seven Ladders Canyon. If you do the Canyon, it is recommended to take a car as it can be difficult to get back to Brasov via taxi or bus. Alternatively, you could also do it as part of a tour that leaves from Brasov. Sibiu is the city we originally flew into when we arrived in Romania. The airport makes it an easy entry point if you’re heading for Brasov since Brasov doesn’t have its own airport (yet). We then hopped on the train to get to Brasov, and the train between the two cities took approximately 2.5 and 3 hours. Sibiu itself has a pretty old town in the centre that people venture on a day trip to see. You can even go on a guided day trip from Brasov to Sibiu. Back in the day (14th century) the city was a bustling trade centre where “guilds” of skilled craftsmen formed the heart and soul of the city. We learned about the German guilds in Sighisoara. Although we haven’t seen a ton of Sibiu, we know how interesting the history of the city can be! Next time we are in Romania, we’ll be sure to spend some extra time there. The Palace of Parliament is a HUGE building worth checking out. 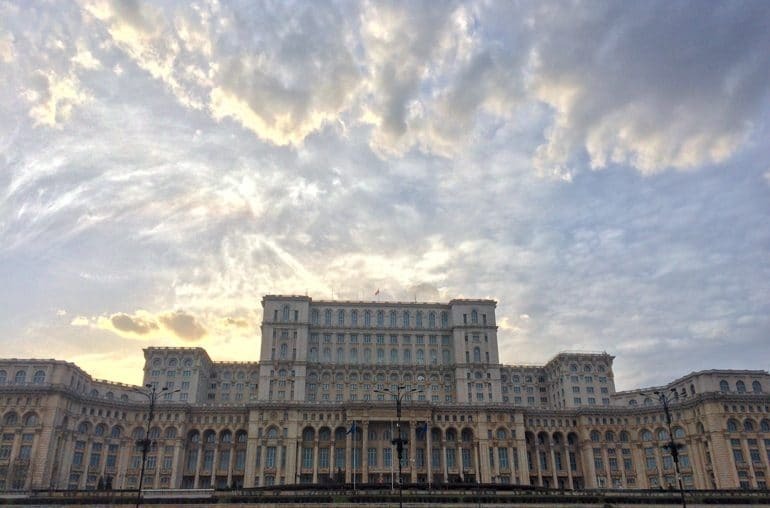 As the Romanian capital, this city should definitely be on your list. It is easy to spend a few days there, but if you don’t have the time you could always make it a day trip from Brasov. Compared to Brasov there is more of a city feel and the city feels more lively in general with lots of young people around. Taking the train from Brasov to Bucharest takes between 2.5 and 3.5 hours depending on the train. Trains run frequently throughout the day but there is a random gap between the morning and afternoon. So be sure to take a morning train if you want to make this a day trip. From the Bucharest North Station it will be easy to reach the city centre by subway. We would recommend you do a walking tour so you get to see a lot of things in a short amount of time. For more information about this and things to do read our guide about Bucharest here. Rasnov is very close to Brasov (about 15 km in the direction towards Bran Castle) and easy to reach by public transportation. The town itself is quite small but if you’re into hiking, biking, and generally being outdoors in nature, then a day trip to Rasnov might be for you. Of note, there’s an old citadel/fortress (like in Brasov) with lots of walking paths and trails surrounding. We’ve actually heard from numerous people that it makes the perfect day trip from Brasov. Unfortunately we never got the chance to go while we were there. 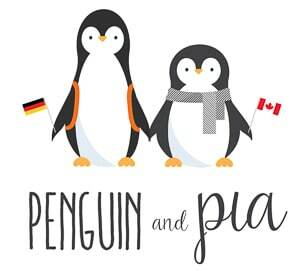 We blame the rainy/wintery February weather. Peles Castle looking gorgeous. Source: Pixabay. We didn’t get to see it. Sad face. Peles Castle is another beautiful castle that is easy to reach from Brasov. Located in the picturesque town of Sinaia, Peles is just south of Brasov and not too far away from Bran castle. So, if you were to rent a car you could actually visit both castles and towns in one day! Peles is often considered one of the most beautiful castles in Europe. It’s a new-Renaissance architecture style and holds lots of artwork inside. If you don’t want to rent a car you can easily reach the town of Sinaia by train from Brasov and then walk to the castle from there (takes approx. one hour). You can check the timetable at the train website – which has been upgraded and redesigned since we lived there and WOW is it better now. Go, Romania! Here’s an epic day trip of Peles Castle, Bran Castle, and Rasnov Fortress, and Brasov that leaves from Bucharest. We know it’s not Brasov, but if you are heading through the region from the capital, it may be an option for you and we wanted to include it. Located to the south-west from Brasov, Piatra Craiului National Park is known for its stunning limestone ridges that are a signature backdrop in the Carpathian Mountains. The park is easy to get to by car since it’s only about 30 km from Brasov. If you wanted to take the train, the closest stop would be Zarnesti. You can check the train schedule on our favourite train website here. Once at Piatra Craiului, there are lots of things to do. From hiking, horseback riding, caving, and camping. The area is home to numerous species of birds, insects, plants, and larger wildlife. You might consider a tour with a guide but you could very well do it on your own! And there you have it – some of the best day trips from Brasov. What do you think? Have you done any of these? As we’ve said, we only got to do a few and we’re dying to return in the nicer weather months to check out a bunch more! Tell us about your favourites if you end up on an adventure outside of Brasov. We’d love to hear it!